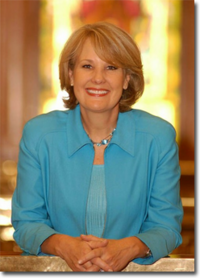 Jane Bergman Norton (born October 12, 1954 in Grand Junction, Colorado) served as Lieutenant Governor of Colorado from 2003 through 2007 under Governor Bill Owens. During her tenure in office she traveled to all 64 counties, chaired the National Lieutenant Governors Association (NLGA), led Colorado’s trade missions to Mexico and the Czech Republic, and chaired the Colorado Commission of Indian Affairs. She is currently executive director for the Denver Police Foundation, which was created to enhance public safety and law enforcement in the Denver community. Jane Norton was defeated for the Republican nomination for U.S. Senate in the 2010 election by Weld County District Attorney Ken Buck. "I am pro-small business and entrepreneurship, pro-marriage, pro-life, pro-conservation, pro-individual and pro-Colorado. We need strong and sensible economic leadership. Think about it. No family sits down at the kitchen table and says, 'Let’s run up the credit cards. It will make us more prosperous.' Families know how faulty that reasoning is. It’s time the government realized it too."